USES: Vitamin D (ergocalciferol-D2, cholecalciferol-D3, alfacalcidol) is a fat-soluble vitamin that helps your body absorb calcium and phosphorus. Having the right amount of vitamin D, calcium, and phosphorus is important for building and keeping strong bones. Vitamin D is used to treat and prevent bone disorders (such as rickets, osteomalacia). Vitamin D is made by the body when skin is exposed to sunlight. Sunscreen, protective clothing, limited exposure to sunlight, dark skin, and age may prevent getting enough vitamin D from the sun. Vitamin D with calcium is used to treat or prevent bone loss (osteoporosis). Vitamin D is also used with other medications to treat low levels of calcium or phosphate caused by certain disorders (such as hypoparathyroidism, pseudohypoparathyroidism, familial hypophosphatemia). It may be used in kidney disease to keep calcium levels normal and allow normal bone growth. Vitamin D drops (or other supplements) are given to breast-fed infants because breast milk usually has low levels of vitamin D.
HOW TO USE: Take vitamin D by mouth as directed. Vitamin D is best absorbed when taken after a meal but may be taken with or without food. Alfacalcidol is usually taken with food. Follow all directions on the product package. If you are uncertain about any of the information, consult your doctor or pharmacist. If your doctor has prescribed this medication, take as directed by your doctor. Your dosage is based on your medical condition, amount of sun exposure, diet, age, and response to treatment. Measure the liquid medication with the dropper provided, or use a medication-measuring spoon/device to make sure you have the correct dose. If you are taking the chewable tablet, chew the medication thoroughly before swallowing. 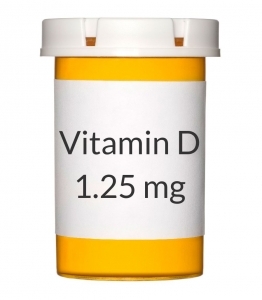 Certain medications (bile acid sequestrants such as cholestyramine/colestipol, mineral oil, orlistat) can decrease the absorption of vitamin D. Take your doses of these medications as far as possible from your doses of vitamin D (at least 2 hours apart, longer if possible). It may be easiest to take vitamin D at bedtime if you are also taking these other medications. Ask your doctor or pharmacist how long you should wait between doses and for help finding a dosing schedule that will work with all your medications. Take this medication regularly to get the most benefit from it. To help you remember, take it at the same time each day. If your doctor has recommended that you follow a special diet (such as a diet high in calcium), it is very important to follow the diet to get the most benefit from this medication and to prevent serious side effects. Do not take other supplements/vitamins unless ordered by your doctor. If you think you may have a serious medical problem, get medical help right away. SIDE EFFECTS: Vitamin D at normal doses usually has no side effects. If you have any unusual effects, contact your doctor or pharmacist promptly. If your doctor has directed you to take this medication, remember that he or she has judged that the benefit to you is greater than the risk of side effects. Many people using this medication do not have serious side effects. Too much vitamin D can cause harmful high calcium levels. Tell your doctor right away if any of these signs of high vitamin D/calcium levels occur: nausea/vomiting, constipation, loss of appetite, increased thirst, increased urination, mental/mood changes, unusual tiredness. A very serious allergic reaction to this drug is rare. However, get medical help right away if you notice any symptoms of a serious allergic reaction, including: rash, itching/swelling (especially of the face/tongue/throat), severe dizziness, trouble breathing. This is not a complete list of possible side effects. If you notice other effects not listed above, contact your doctor or pharmacist. In the US - Call your doctor for medical advice about side effects. You may report side effects to FDA at 1-800-FDA-1088. In Canada - Call your doctor for medical advice about side effects. You may report side effects to Health Canada at 1-866-234-2345. PRECAUTIONS: Before taking vitamin D, tell your doctor or pharmacist if you are allergic to it; or if you have any other allergies. This product may contain inactive ingredients, which can cause allergic reactions or other problems. Talk to your pharmacist for more details. Before using this medication, tell your doctor or pharmacist your medical history, especially of: high calcium/vitamin D levels (hypercalcemia/hypervitaminosis D), difficulty absorbing nutrition from food (malabsorption syndrome), kidney disease, liver disease. Before having surgery, tell your doctor or dentist about all the products you use (including prescription drugs, nonprescription drugs, and herbal products). During pregnancy, doses of vitamin D greater than the recommended dietary allowance should be used only when clearly needed. Discuss the risks and benefits with your doctor. This medication passes into breast milk. Consult your doctor before breast-feeding. DRUG INTERACTIONS: Drug interactions may change how your medications work or increase your risk for serious side effects. This document does not contain all possible drug interactions. Keep a list of all the products you use (including prescription/nonprescription drugs and herbal products) and share it with your doctor and pharmacist. Do not start, stop, or change the dosage of any medicines without your doctor's approval. Check the labels on all your prescription and nonprescription/herbal products (such as antacids, laxatives, vitamins) because they may contain calcium, magnesium, phosphate, or vitamin D. Ask your pharmacist about using those products safely. This medication may interfere with certain laboratory tests (including cholesterol tests), possibly causing false test results. Make sure laboratory personnel and all your doctors know you use this drug. OVERDOSE: If overdose is suspected, contact a poison control center or emergency room immediately. US residents can call the US National Poison Hotline at 1-800-222-1222. Canada residents can call a provincial poison control center. Symptoms of overdose may include: seizures, confusion, irregular heartbeat. NOTES: Keep all regular medical and laboratory appointments. If your doctor has prescribed this medication, laboratory and/or medical tests (such as calcium/magnesium/phosphorus levels) should be performed periodically to monitor your progress or check for side effects. Consult your doctor for more details. Foods rich in vitamin D include: fortified dairy products, eggs, sardines, cod liver oil, chicken livers, and fatty fish. STORAGE: Store vitamin D products (except alfacalcidol) at room temperature away from light and moisture. Do not store in the bathroom. Store alfacalcidol drops in the refrigerator between 36-46 degrees F (2-8 degrees C). Do not freeze. Keep all medications away from children and pets. Do not flush medications down the toilet or pour them into a drain unless instructed to do so. Properly discard this product when it is expired or no longer needed. Consult your pharmacist or local waste disposal company for more details about how to safely discard your product.